CDR Salamander: So, the French are Lapping us in Frigates, Again? So, the French are Lapping us in Frigates, Again? Have you heard about the upcoming Frégate de Taille Intermédiaire [FTI – Intermediate Frigate] for the French Navy? Well, you have now - and I have a feeling it will fill you with a sense of rage if you have any blood left in you. We should be building this. We should have a diverse and balanced fleet. 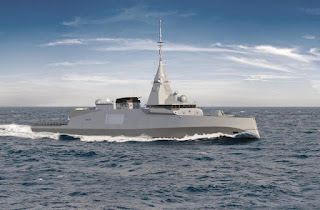 As we suffer with the LCS pier queens, the French already have their superb version of the FREMM with the Italians ... but they are not happy with that. Not that it is bad - just the opposite - it is excellent. It is just that they understand how to design and build a balanced fleet. Perhaps notsomuch efficient ... but effective? I'm not a fan of the tumblehome bow, but I'll allow a class to experiment with. Given the small amount of money they have to spend - they at least seem to be thinking right. 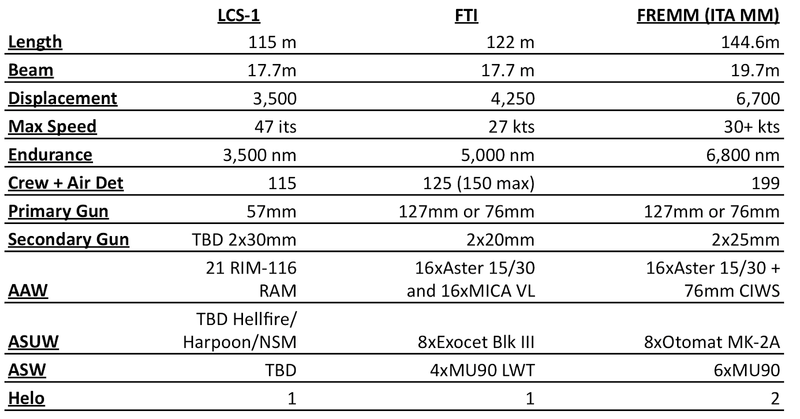 The FTI medium-size frigate will feature modular design with increased self-defence and long-range capabilities. Overall length and midship beams of the ship are 122m and 17.7m respectively. With a displacement of approximately 4,200t, the frigate will carry up to 150 personnel, including 110 crew and 15 for helicopter detachment. The ship will incorporate digital technologies for data processing and detection of evolving threats. Its wheelhouse will be positioned in the middle section. A hangar and flight deck located at the stern will of the frigate will allow for the operation of a single unmanned rotorcraft system and / or NH-90 medium class military helicopter equipped with FLASH-based dipping sonar and MU90 lightweight anti-submarine torpedoes. 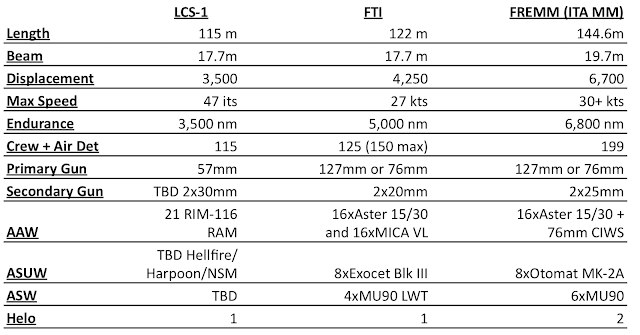 The medium-size frigate will additionally carry rigid hulled inflatable boats for patrolling and transportation. The FTI will be armed with a variety of anti-aircraft and anti-submarine armament to attack aircraft and submarines and their crew. An Oto Melara 76mm or 127mm naval gun will be mounted in a gun turret located in the bow deck to fight against enemy aircraft, submarines, missiles and ground-based threats. 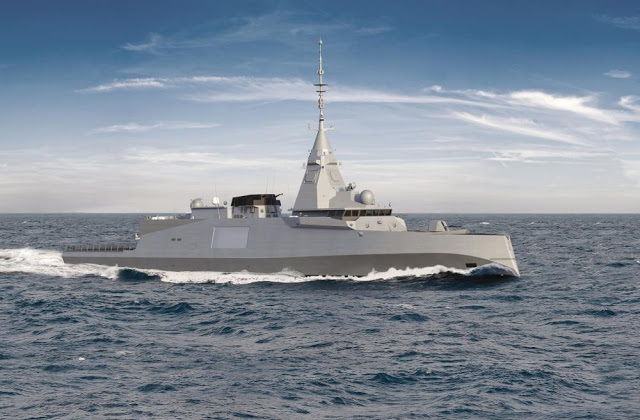 Defence against littoral and coastal land threats will be provided by eight Exocet MM40 Block 3 all-weather weapon systems, installed amidships. 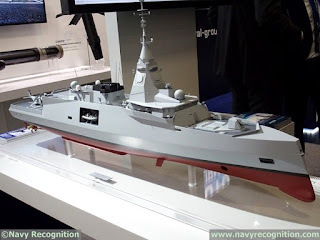 The frigate will also be fitted with two eight-cell A-50 type Sylver vertical launch systems for Aster 15 surface-to-air missiles in the bow, two 20mm remotely-operated weapons at the rear, 2×2 deck-mounted torpedo tubes for MU90, and an anti-ship missile decoy launching system. Read up on the links above and ponder - for a global naval power - who is really building the right fleet? Now THATS the Navy I Like to See!